The Clydesdale is Scotland’s heavy horse. Clydesdales can trace their origins to the mid 1700s when James Hamilton the 6th Duke of Hamilton, who lived from July 1724 to January 1758 and who was a Scottish Peer, imported six heavy stallions from Flanders to Scotland to breed them to some of the best local Galloway mares. The horses from Flanders were almost certainly Brabant horses and Belgian Draft Horses. 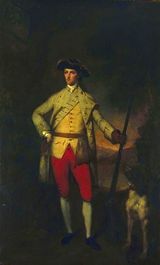 James the Duke of Hamilton may get the credit for starting the Clydesdale breed because of his own fine lineage, but history records that decades earlier in 1715, Scotsman John Paterson of Lanarkshire imported a black Flemish stallion from England. The resulting cross with heavy draft mares produced large horses, brown or black in colour, with white markings on their faces and legs. These were well received and may have sparked the demand and impetus that was acted upon by James Hamilton in the first place. A horse foaled in 1810 called Glancer (also known as Thompson’s Black Horse), is found in the pedigree of many modern Clydesdales. The Clydesdale Horse Society was formally launched in June 1877. The first recorded use of the name “Clydesdale” for the breed was in 1826, and by 1830, a system of hiring stallions had begun that resulted in the spread of Clydesdale horses throughout Scotland and into northern England. The first Clydesdale breed registry was formed in 1877. At one time, Scotland had around 140,000 part or fullbred Clydesdales working on farms and in towns and cities. Clydesdales were conscripted by the army to serve in World War I and those animals must have had a terrible time in the trenches. By the early twentieth century, Clydesdale’s popularity began to wan as technology changed farming. Following World War II, the number of Clydesdale breeding stallions in England plummeted from more than 200 in 1946, to 80 in 1949. In 1975, the Rare Breeds Survival Trust listed them as vulnerable to extinction, which is where they remain today, with just 500-900 animals in the United Kingdom at present. Worldwide, their numbers are slowly climbing, thanks to exports to Australia, Canada, New Zealand, South Africa and the United States, but with only about 5,000 in the entire world the breed is still considered threatened. 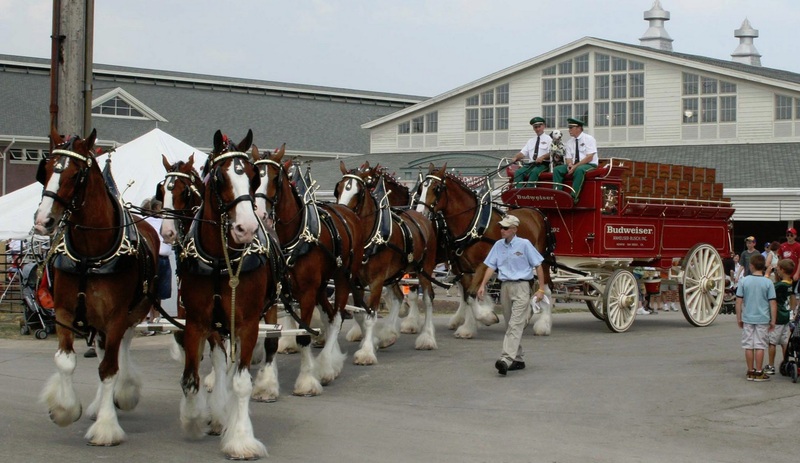 Although originally one of the smaller breeds of draught horses, Clydesdales are now a tall breed. Often bay in color, they show significant white markings due to the presence of sabino genetics. * a group of white spotting patterns in horses that affect the skin and hair. A wide variety of irregular color patterns are accepted as sabino. In the strictest sense, “sabino” refers to the white patterns produced by the Sabino 1 (SB1) gene, for which there is a DNA test. Clydesdale stands on average 16.1-17.1 hands, although some are even taller*. Clydesdales hold their noble heads proudly and have well-shaped, alert ears. They have intelligent and kind eyes, and a long, well-set neck with high crests that lead to high withers. Their strong, short backs and powerful quarters are supported by long legs with silky feathers. They can have either bay, black, or brown coats (rarely chestnut) and it is not uncommon for them to have white patches up their legs and under their belly. 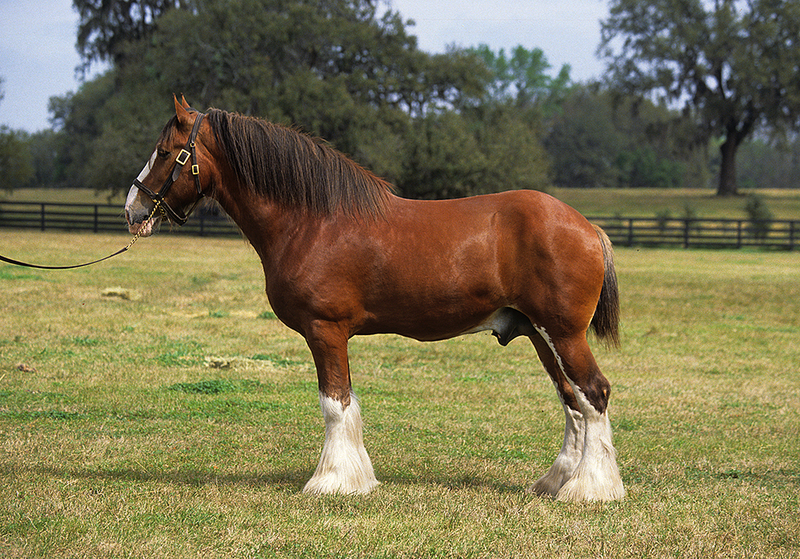 Clydesdale’s hooves are very large and despite its overall size, the breed is noted for its energetic, high-stepping action, which makes it one of the most elegant heavy horses. The Budweiser Clydesdales are some of the world’s most famous horses, staring in Super-Bowl quality TV commercials everywhere the beer is sold. Anheuser-Busch Clydesdales are pictured in this 2009 news file photo. Other members of the breed are used as drum horses by the British Household Cavalry. They have also been used to create and improve other breeds. Clydesdales are very versatile horses, and as such they are still used as draught animals in agriculture, and for logging as well as movie set work. They do well showing in hand, at ploughing matches, pulling wedding carriages, and pleasure driving in harness, and being ridden.